There was a house on the site of Weald Hall from 1062, though it was rebuilt in red brick by Sir Brian Tuke, secretary to King Henry VIII, following the Dissolution. It was given a new principal (south) façade in the early eighteenth century and the 500-acre park was remodelled by Lancelot 'Capability' Brown (1732-45). It was bought by Thomas Tower, a lawyer and MP (Wareham) for use as a large hunting lodge in 1752. His son Christopher Tower - also a lawyer - succeeded in 1778, and it has always been thought that it was he who immediately engaged Adam. There is evidence, however, that shortly before his death Thomas Tower had approached Adam. 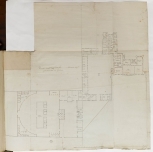 Though Adam's first drawings for Weald Hall are dated October 1778, and Thomas had died a month earlier on 4 September 1778, one of the drawings is inscribed in Robert Adam's own hand as being for Thomas (Adam volume 21/114). Using an incorrect name for his patron is not the sort of mistake that Robert Adam would make, and we must conclude that Thomas had commissioned work from Robert Adam, the drawings for which arrived in October, and it was then continued by Christopher. With the exception of one ceiling in the dining room Adam made no alterations at Weald Hall. The house was demolished in 1950-51, due to war damage, and the grounds purchased by Essex County Council in 1953 for use as a public park. The foundations of the house are still visible and serve as a car park. The only feature of the landscape to survive is St Mary's Chapel, once a sixteenth-century red brick garden lodge in the same style as the house.